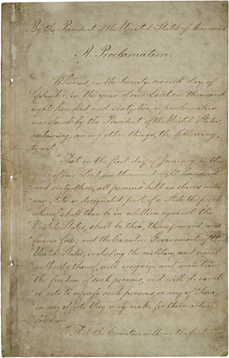 The Emancipation Proclamation will be on display from December 30, 2012, to January 1, 2013, for its 150th anniversary. To prepare this document for display, a senior conservator examined the signature page with a binocular microscope. The fifth page with Lincoln's signature shows darkening of the paper from excessive light exposure. This important document is displayed for a very limited number of hours each year in order to minimize damage. NGS does not imply endorsement of any outside advertiser or other vendors appearing in this blog. Thanks for sharing Emily -- fascinating bit of history!